The back cover, aka the wraparound, was necessary to publish a paperback version of the book PENELOPE AND THE BIRTHDAY CURSE. I decided at this point to have someone do it for me. I had contacted a number of book cover designers and was quite surprised by the range of prices. They fell in the range of $30 up to $299. The amount of work required can vary too. At its simplest, the cover is a stock photo with the title and author name dropped on top. Sadly that’s what some author’s get for their $299. After contacting a number of designers I decided to have Joleene Naylor do the wraparound cover. Not only is she a designer but an artist and author. This gave me the idea to create an image of Penelope. Joleene did a superb job. She created the character as described in the book with lots of nice touches. Even down to subtle details, such as the untied shoe lace. Then the original front cover from Part 4 of this series was combined into a wraparound with Penelope on the back by a text window and the knife from the front cover was added to tie the front theme to the back. Here is a picture of the cover. The detail may not be discernible in this blog picture, but it gives an idea of what it looks like. The white box is for the barcode and ISBN. Page count is an important detail that helps determine the cover’s size. More pages mean more cover in the center for the spine. Another thing, page count comes in multiples. I will give you my spin here. Big publishing companies use large sheets of paper that can have 8, 16 and perhaps 32 pages per sheet. Once printed the whole thing is folded and cut. The packets created are assembled in the correct order and the cover is attached. CreateSpace used somewhat smaller page, but gets 4 printed pages per sheet. For my book which is 6 x 9, the cut sheet size becomes 12 x 9 and then is folded in half. That means a fixed amount of pages depending on what is needed. 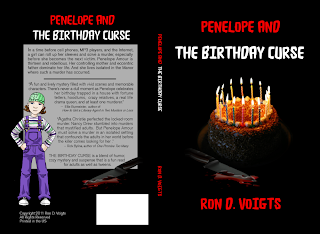 PENELOPE AND THE BIRTHDAY CURSE has 184 pages, which meant 46 sheets before folding. To add more pages would require increments of 188, 192, 196, 200, etc. If you are a diehard do-it-yourself type, you may be interested in How To Get A Cheap Book Cover available at Smashwords. Subtitled: “From tips on how to woo your cover artist to DIY”. Best $1.50 you’ll ever spend! Cost for Penelope rendering was $20 and wraparound cover $30. Ron D. Voigts is the author of the Penelope Mystery series. His current title PENELOPE AND THE CHRISTMAS SPIRIT is now out.